We hope all the kids enjoyed their snow day yesterday! It was perfect snow in the morning for building snowmen and forts. So now tht the snow seems like it is here to stay I’ve brought out the Christmas and holiday albums. Here’s a little sample of what you can find this year at Backbeat and more to come! Plus – we will have a little update on our Record Store Day – Black Friday sale and special releases that we recieve, oh yeah lots coming in today! The A-side was originally recorded in 1998 and its title has been appropriated by Stripes fans as a term to describe themselves as a group. The b-side features Meg singing an a cappella version of “Silent Night” coupled with Jack reading the Story of the Magi from the Bible. The whole thing is a warming, heartfelt pile of Christmas goodness. Dig in! One of the most popular and beloved holiday albums of all-time now available for the very first time on collectable green vinyl!! A Charlie Brown Christmas was voted into the Grammy Hall of Fame in 2007. In 2012 the album was added to the Library of Congress’s National Recording Registry list of “culturally, historically, or aesthetically important” American sound recordings. A piano-jazz holiday classic!! 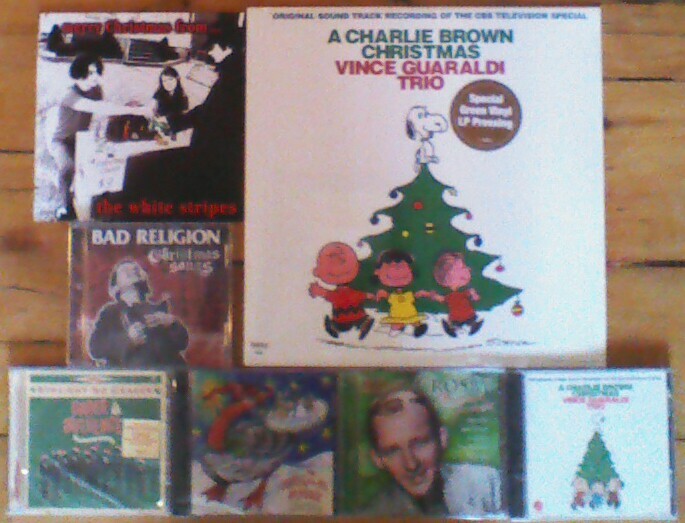 Who better to help you celebrate that most wonderful time of the year than holiday favorites Bad Religion? Bad Religion have threatened to record an album of seasonal classics for years, and now they’ve gone and done it, tackling eight chestnuts in their classic punk rock style. From ‘White Christmas’ with its nod to pioneers The Ramones, to the glorious choirboy intro to ‘Hark! The Herald Angels Sing’, Christmas Songs is the record you need to get your holiday household’s toes tapping. Straight No Chaser’s first holiday release in 4 years, Under The Influence: Holiday Edition! The new EP includes 8 tracks, including some of your holiday favorites, with appearances by Paul McCartney, Colbie Caillat, CeeLo Green, and Otis Redding! A second chorus of fresh seasonal songs. This CD features Ottawa area musicians that contributed their time and talents to support Goose. Goose is a not-for-profit association to promote Ottawa-area songwritters. We don’t even need to tell you anything about Bing Crosby music at Christmas. Certainly is a must have if you don’t already have it. Previous Post Locally made wood record crates from Flook D. Doo now here!